These 5 companies prove that it is possible to create great Pinterest B2B accounts. At first glance, it’s obvious that Pinterest is a perfect platform for B2C companies to market their products. It’s still overwhelmingly product-image oriented, overwhelmingly female (though the percentage of men on Pinterest continues to grow) and overwhelmingly an escapist network. However, with the rising popularity of infographics, the Pinterest tech category and Pinterest as a marketing platform overall, many companies are quickly learning what it takes to have great Pinterest B2B accounts. 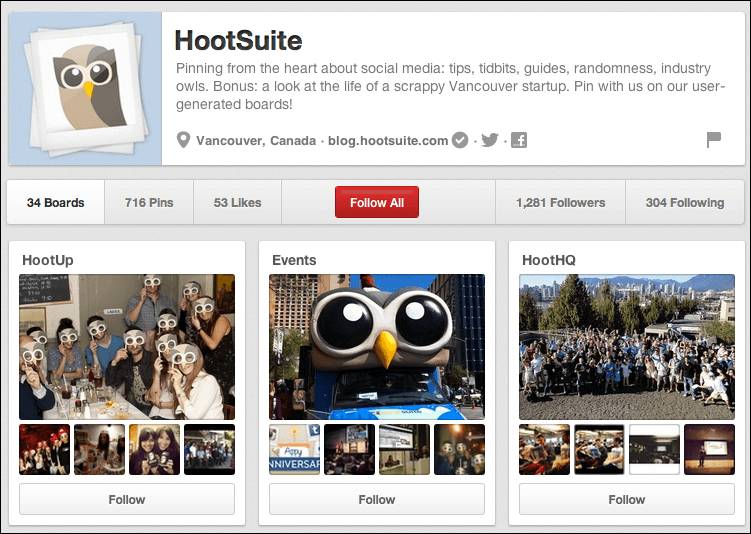 One of the ingenious ways HootSuite harnesses the power of Pinterest is through user generated boards. So far they’ve created interactive community boards for over 10 countries, a board where you can create and pin your own owl-inspired designs, a “Hoot Club” board for members to pin whatever their heart desires, as well as many others. By allowing users to take the reins, HootSuite provides them with a unique Pinterest experience. Since their creation in 1892, General Electric has learned that to maintain their status as one of the top B2B companies in the world, they must learn to adopt new media. GE does a great job of making their more technical offerings, such as their innovations in health care technologies, tangible to the average user through inspirational boards and pins. As one of the top names in B2B email marketing, Constant Contact does an excellent job marketing themselves on Pinterest. While much of their content is marketing related, they keep their Pinterest relevant by creating boards for major events – such as the 2012 Summer Olympics. Pinterest‘s inherently visual interface has also helped Constant Contact show off new email template designs to both current and potential customers. HubSpot‘s Pinterest page has everything the B2B and B2C community desires in a Pinterest account. They’ve created boards dedicated to hilariously bad stock photos, memes, infographics and even the Internet’s favorite animal – kittens. On top of that, HubSpot‘s content related to marketing is spot on. They offer free eBooks, promote useful webinars and generally pin about all things marketing. Having a combination of informational and light hearted content helps keep their users engaged. Because no one Pinterest strategy is right for every brand, it’s important to keep track of what content is resonating with your audience. Just because your target audience is businesses on Pinterest, that doesn’t necessarily mean they want to see pins only related to their B2B interests. However, just because it’s Pinterest it doesn’t necessarily mean they only want to see adorable animal photos. By tracking what resonates with users through Tailwind‘s Pinterest Analytics and maintaining a healthy mix of work and fun, you too can reach Pinterest B2B greatness. This post was originally featured on the Tailwind blog as 5 Great Pinterest B2B Accounts. They have large quantity of repins?/ I found the followers are not many..